The wreckage of a Consolidated PBY Catalina from Patrol Wing Two in front Ford Island's Hangar 6. Seven minutes after Kaneohe Naval Air Station was attacked, Captain Kakuichi Takahashi (November 29, 1906 - May 5, 1942) personally led nine Aichi D3A Type 99 dive bombers against Ford Island Naval Air Station. One bomb, probably Takahashi's, struck the parking area near ramp four; One bomb struck the underwater portion of ramp four. The explosions and subsequent fire completely destroyed six PBY-3 airplanes, damaged one PBY-3 airplane beyond repair and put the remaining five out of commission for days. 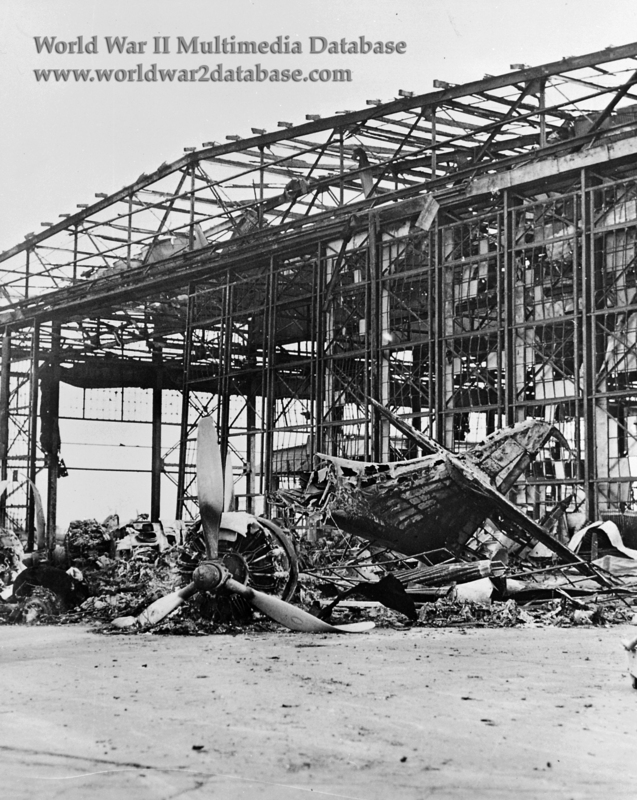 Another six bombs struck Hangar 6, igniting the the small arms magazine in the northeast corner; the resulting fire burned the wooden part of the hangar and numerous miscellaneous squadron spare parts before being brought under control. Aviation Ordinanceman 1st Class Theodore ("Ted" or "Thomas") W. Croft (March 8, 1913 - December 7, 1941) of Patrol Squadron 21 (VP-21) was killed in Hangar 6, the first American to die in the Pacific War.